I published this feel good semi-political cartoon last Sunday. Today I made a relevant addition and I hope Mr. Day does not mind. All of Florida is facing a Category 5 storm that looks like it will produce major disruptions this weekend. Florida, the US East Coast, and the Gulf Coast are no strangers to tropical disturbances. I vividly remember first grade (1954) in Virginia and being sent home early because of a hurricane named Hazel. We were a good distance from the coast but the powerful hurricane came inland after a landfall near Myrtle Beach, South Carolina. In my area, there were trees uprooted and a general disruption for several days. When I moved to Florida over 40 years ago, I knew that hurricanes were a possibility and being closer to the ocean enhanced the overall risk. We went many years in this area with no landfalls, until 2005. That year we had three direct hits and none since. Names I will always remember; hurricanes Francis, Jeanne and Wilma. South Florida did have a major hurricane in August 1992. It was to hit in Palm Beach County however took a southerly course. Landfall was southern Dade County / Miami. Andrew had a measured wind gust clocked at 177 MPH – Category 5+. Homestead, a small town on the edge of the Florida Everglades, received the brunt of the storm. Massive destruction. I did volunteer work in Homestead in the aftermath of Andrew and saw destruction that I will never forget. There were whole homes lifted off their foundation with nothing left or even nearby. Just slabs with pipes sticking up from the cement. Even the toilets were gone. My best description - like a new home, had been started with no building material delivered yet. The family was living in a nearby pickup truck with a camper cover. We left two cases of water and alerted another crew to bring food. A little, further down the road there was a completely vacant field, maybe 40-50 acres. Evenly spaces were craters about 5 feet in diameter and 2-3 feet deep. There was no clue as to what had been in the field. Miles down the road we came up on a massive pile of mature orange trees. Every orange tree in the grove had been “sucked out of the grown” and deposited in a big pile. Closer in to Miami there was a home off in the distance that looked like Barbie doll house. It was a two story home with the complete front of the house gone. Most of the furniture was still in place and from a distance it looked like you could just reach in and rearrange the rooms. Tuesday evening I found this on Weather Underground: Irma poses the most serious hurricane threat to northern Cuba and Florida since at least Hurricane Andrew (1992). Thus my area of Florida in now planning for what the Weather Underground described as “Category 5 Irma - The 5th Strongest Atlantic Hurricane on Record”. There will likely be disruptions in my blog posts going into the weekend and after. Wherever the landfall occurs there is likely to be damage. Let us all hope for a minimal loss of property and no loss of life. I've been thinking about you with all the talk of Irma in the news. I pray that you'll be spared, Rhonda. You're welcome to visit the Northwest to get away from it all, but you'll have to put up with a lot of smoke from all the wild fires we're having here. 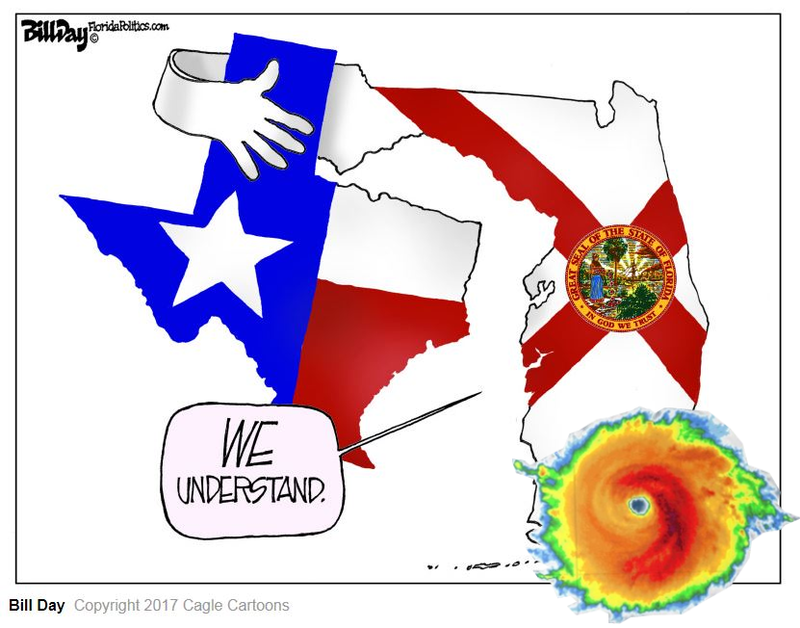 Not that it even compares with a hurricane. Be safe and stay well. How close to the coast do you live. sometimes even a mile makes a difference. 3.7 miles to the beach. Thankfully I do not live in what we call a "Flood Zone". The storm surge will be somewhat absorbed by the intercoastal before it could reach me. Take care, and hopefully, not get the worst of it. Your life is much more important than the blog. Next we hear from you, I want to know that you (and family) are safe, secure, and in good health. Nothing else matters after that. See you when you have a chance to get back to blogging. Thank all of you for your kind comments. I have several post "in the can" for a day or so and will post as long as the power stays up. I am not sure I would evacuate so late in the game, tonight Wednesday I already have reports of heavy traffic on the turnpike around Okechobee from a friend leaving Homestead. Emily R - In Miami and staying! Rhonda please be careful. If you are thinking about getting out of there, using the turnpike to link up with 75, expect a lot of delays. So far quite a few stations are out of gas. Again please be careful.